If you are looking at smart home technology options around Darien, CT, you may run into a fair amount of hyperbole. There are smart devices that all but promise to change your life, thermostats that know when you’re home and when you’re not, and lights that can turn into a rainbow of colors. All of those devices may do wonderful, innovative things, but do any of those things by themselves make your life better? A smart home may have many smart devices. 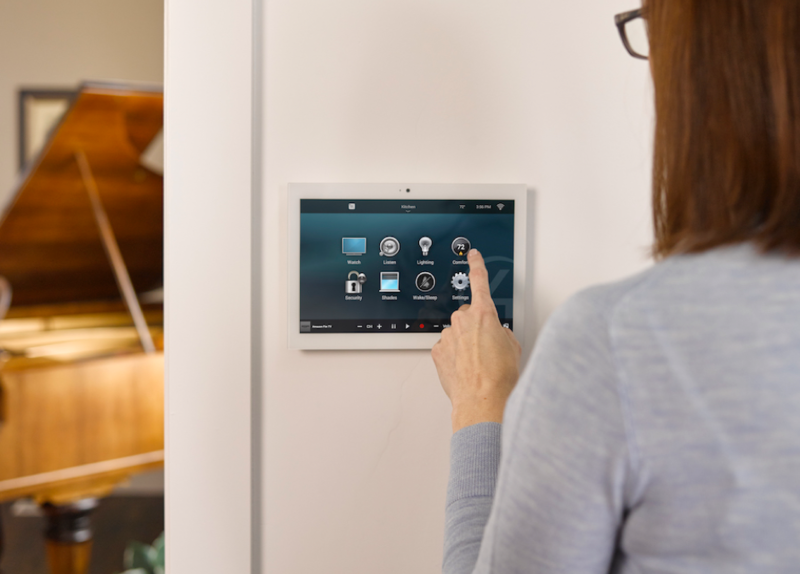 You have probably heard of many of them; smart thermostats, smart lighting, smart security cameras, smart locks, and many others. You may even have one or two of them, like a Nest thermostat. Beyond having remote control of a device via an app, the way these devices start making your life easier is when they all start working together to fit the way you live—demanding less of your attention, automating routine functions, and making time available for more important things. That’s where Control4 smart home automation comes in. It orchestrates all your smart devices into a cohesive, manageable system that works for you. Keeping your home safe and secure is always a prime concern. There are many small ways that a Control4 system makes that happen. Every Control4 Touch Screen has a camera and audio capability. With a Control4 Door Station, you can remotely see and talk to anyone at your front door. With multiple security cameras, you can view each feed on a variety of screens; through a touchscreen, your phone or tablet, or on a TV. When you’re away from home, you can get an alert if a camera detects a person, and you can view that activity and even interact with the person at the front door. If it’s someone with a delivery, you’ll be able to go one step further and let them in to drop off the package and lock back up when they leave. Sensors will monitor your home and alert you instantly of a water leak in the basement or a bathroom, and take action to avert potentially serious damage. Similarly, if a smoke detector is triggered when you’re not home, your system will alert you so you can respond quickly. If you have smart lighting, a Control4 system can activate “Mockupancy” mode while you’re away – turning lights on and off in a realistic pattern that gives your home a lived-in look. The system learns your usage patterns and simulates them, and it can even include turning TV and audio equipment on and off as part of that. With lighting control, your home gains touches of luxury and efficiency at the same time. Motion sensors can trigger lights, hands-free. Those same sensors can be programmed with a timer to turn lights off automatically when the room is unoccupied for a given period. A “Goodnight” scene sets the level of all the lights in your home the way you want them at bedtime; for example bedroom lights may turn off with a warm, dim hallway light remaining on for any restless sleepers. With the same press, the alarm system can activate, and all door locks can secure the house in unison. Wireless keypads allow you to have lighting controls where you want them, and not where some wire happens to be located in the wall. A Control4 Wireless Thermostat can be placed in the most convenient location for your home. Beyond giving you the ability to remotely control the temperature, they can also be integrated with lighting. A “Welcome Home” scene could set lights at the preferred level while dialing back the temperature. An “Away” scene could set everything to more eco-friendly settings. If you incorporated motorized smart shades, they could be included in the mix for perfect control of ambient light, enhancing energy efficiency, and protecting interiors from harmful UV rays. Have you ever forgotten which remote turns on the TV, which one controls the Blu-ray player, and what button on your AV receiver chooses the right input? The jumble of remote controls to manage multiple devices along with the complexity of different interfaces to get the right content playing on the right screens and speakers can be incredibly frustrating—particularly when you are just trying to relax. Control4 simplifies all that. It can turn entertainment control into a one-button affair. For a movie night, not only will it set the TV, Blu-ray player or streamer, and AV receiver correctly, it can also turn on a gas fireplace, dim the lights, and adjust the thermostat with that same single button. For a whole-home audio experience, Control4 has a full suite of products to provide hi-fi sound in every room in your home. With a Control4 Tabletop Touch Screen or even an iOS or Android device, you can call up a variety of music sources to play in one room or several areas in your home. If you want your lights dimmed to reflect the mood of a particularly relaxing jazz playlist, that can be accomplished by one button too. We can tell you more, but we’d rather show you. Visit our Control4 Certified Showroom to see, hear, and experience home automation firsthand. Make an appointment with us today and #C4Yourself!